That's TOLLYwood, the Telugu-language cinema of Andhra Pradesh, just one of many regional cinemas running parallel to the dominant Hindi language film industry centred on Mumbai. By definition Bollywood is loud, colourful, melodramatic, broad, and takes many of its cues from the West; Tollywood, from what I've seen so far, is just as loud and colourful, even MORE loopy and pulp-driven, and prone to what is politely called in the film business “cultural appropriation”. 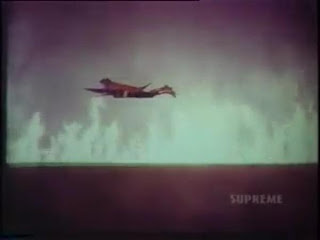 Throughout the Sixties and Seventies, Tollywood cranked out hundreds upon hundreds of mythological fantasies, spy films and “curry westerns” - all musicals, mind you – and in Superman (1980), they manage to happily mash up their three favourite genres AND leave room to plunder the costumed superhero film as well, barely twelve months after Christopher Reeve's man-in-tights blockbuster. 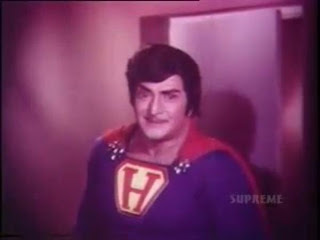 Which, in theory at least, makes the Telugu Superman the best of all possible worlds, and potentially the greatest movie of all time. 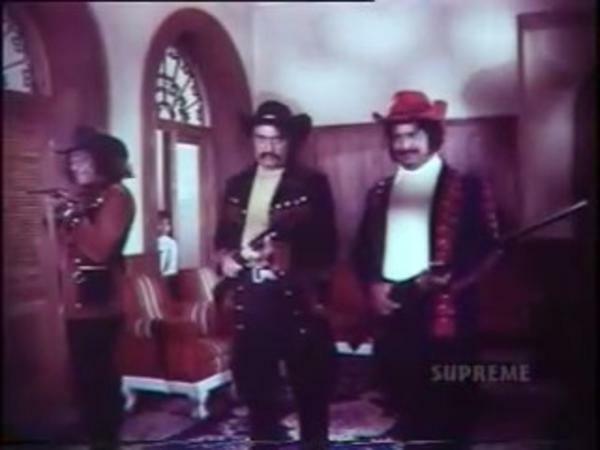 The film opens with a young child named Raja witnessing his father gunned down by three mysterious gunslingers. 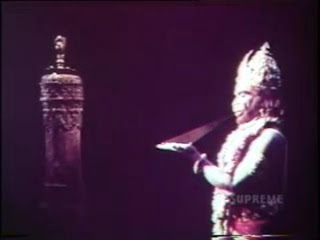 It's just before the family was due to attend a festival at the Temple of Hanuman the Hindu monkey-faced god, and so Raja prays at base of the statue, singing book reviews and throwing petals at Hanuman's feet. In a final desperate attempt for the Ape-God's attention, he stabs himself in the stomach and splashes blood all over the statue. A towering Hanuman suddenly materializes, picks up the tiny prostrate body and breathes life back into him. Boy Raja is now filled with divine powers, and in the tradition of all good westerns, and quite a number of bad ones too, swears revenge of the three cowboys who shot his pa. He grows up into a strapping “young” man complete with familiar-looking blue suit - that's “H” for Hanuman! 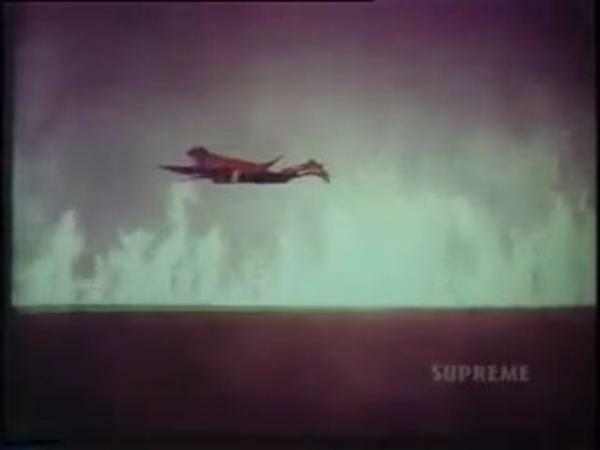 - and this own theme song: “Superman.... (la la la la la), Superman... (la la la la la la)....”. 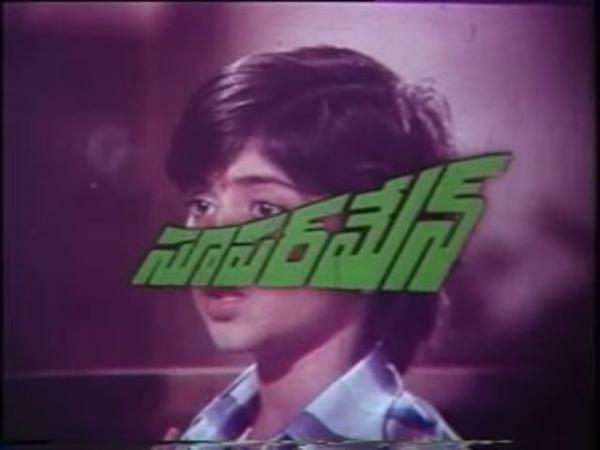 Between flying gigs and stopping runaway buses he finds time every now and then to woo the film's own Margot Kidder, the delectable Jaya (Jayapradha), daughter of his mine's co-owner Mr Bangaram, in a series of rancid show-stoppers. 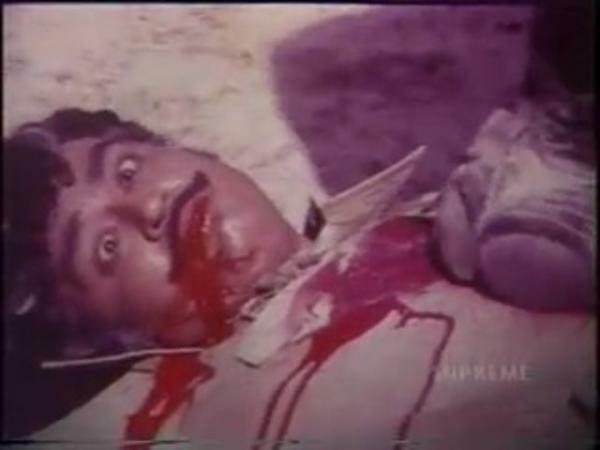 But this is a Curry Western Revenge film, let us not forget, so back to the bloodied trail of vengeance. One cartoon baddy controls a herd of remotely-operated Attack Elephants; another owns a midget assassin who hides stands in small cupboards. If that scene reminds you a little of Hervé Villechaize as Christopher Lee's dwarf butler in The Man With The Golden Gun (1974), you'll be amused to note that Superman also cribs an entire scene from the 1974 Bond film, in which our hero turns a bullet-maker's own gun on his crotch. 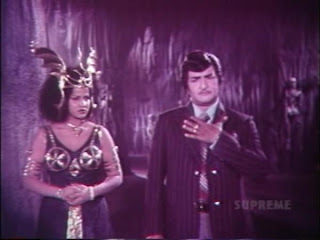 The third and final villain is Dharma Rao, also known simply and modestly as The King, a wily paythan in charge of a Casino in “Hong Kong” (although I suspect the budget didn't stretch to airfares past Singapore or Malaysia) and – horror of horrors – the father of Raja's sister Laxmi's betrothed. It's not exactly a shotgun marriage the bride's mother has planned, but it's interesting to note that the idea of losing one's chastity while unmarried in Superman is tantamount to suicide AND matricide, and is a stark reminder we're culturally speaking a loooooong way from Hollywood Boulevard, Toto. Raja (to Hong Kong hotel clerk): Do you speak Telugu? Clerk: Yes. It's part of the service. 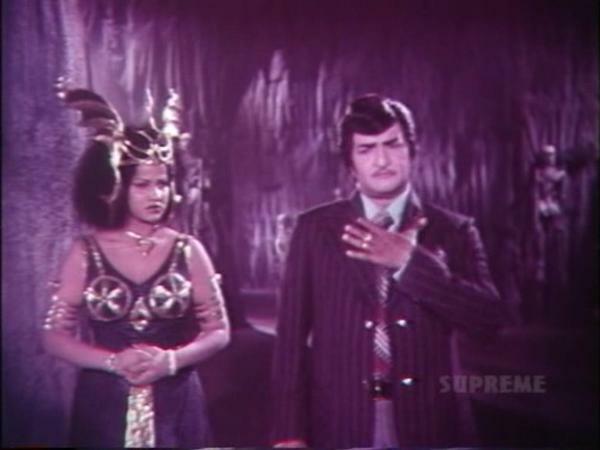 The adult Raja is played with relish by popular Tollywood heartthrob Rama Nandamuri Taraka Rao, or NTR, born in 1923 and a superstar in Telugu films since 1949. Which makes him – well, you can do the math. The fact that he's older than the actress playing his mother doesn't seem to phase anyone; peering at his convex torso and fading matinee-idol looks through the mountains of makeup, there's a slightly creepy, almost waxen quality about him – reminiscent of Liberace's brightly painted corpse. Whether he's defeating twenty blackbelts in an obligatory kung fu sequence without bending a single steel strand of his breeze-proof bouffant, untangling the loins of the King's bewitching, wing-helmeted supernatural temptress Miss Lee, or crushing his adversaries to a pulp under costumed booties, NTR certainly makes a meal of it. A three-course meal, that is, with every food item varnished a deep brown, and subsidized with a Sizzlers' over 55s discount card. So how does the theory work out? Superman is certainly one of the most brazen ripoffs of the Man of Steel, and by tying in his powers to the pantheon of Hindu mythology, one of the strangest. At just over two hours your staying power will be sorely tested, but that's all part of going deep into previously unexplored territory, filmically speaking. Time to discover the joy of Telugu mythological western superheroics in 1980's Superman (la la la la la la).